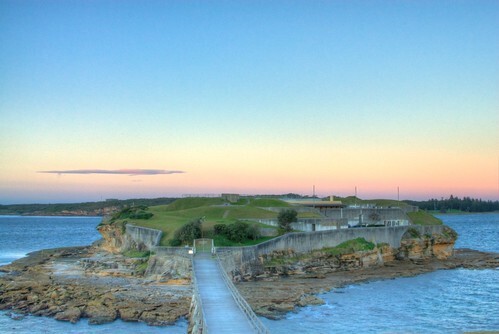 Bare Island, La Perouse is a beautiful spot for photographs, particularly for a 6.58am sunrise with the beautiful greens and greys of the islands contrasting with the colourful sky. I chose this perspective to try to make the island inviting. You're drawn across the bridge to the inviting island that was once a fort protecting Sydney's Botany Bay. If you've flown into Sydney you've probably flown right over Bare Island. I do like this image, but want to go back soon and re-shoot it so that the edges of the island aren't cropped.